Fargesia bamboo plants have reliable and non-invasive clumping habits and are very hardy bamboos. Originating from higher altitudes in countries such as China, plants from the Fargesia genus are really suitable for cooler climates. Growth being predictably clumping, there are lots of options. Fargesia can be used for planting hedging, screening parts of a garden, or in a prominent position as a specimen. Fargesia varieties are also suitable for using as container plants. Planted in pots they can be used as a feature on a deck or patio, or close to walls and fences. 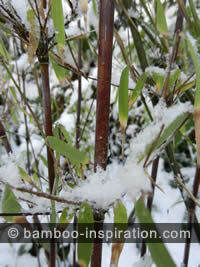 You can see a hardy Fargesia in winter in the picture on the right. Although it has lost some leaves they will come back in the spring. Words used in describing different species include; dense, upright, arching, umbrella, small leaves, shade tolerant. Some varieties are hardy down to -29C (-20F) but some will only tolerate -10C (14F), check with the individual species to be sure. Fargesia heights start at 2 metres (6.5ft) with some species reaching significant heights, and they produce lots of culms with various spread habits from 1 metre (3.3ft). Plant out in the ground or in pots and containers. Fargesia bamboos originate at high altitudes and are native to woodlands, they are therefore unlikely to tolerate full sun all day; generally they have preference for light and partial shade and can be planted in an area of the garden that’s semi-shaded and needs brightening up, and that gets dappled shade for most of the day. There are approximately 82 Fargesia species; this list is some of the hardy Fargesia bamboo plants that seem to be more popular or widely available for temperate gardens. Fargesia nitida jiuzhaigou is one of my favourites.